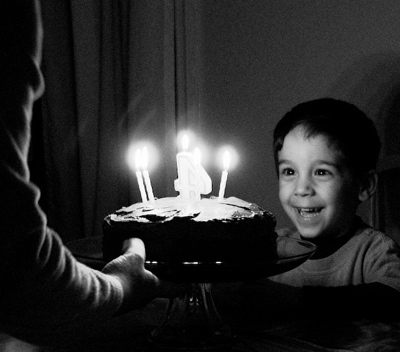 Grab Shot 97 - "Absolute Delight"
"Here is a photo of my grandson receiving his birthday cake on his fourth birthday," said Rusty Rhodes. "I call it "Absolute Delight"." "It was taken with my Nikon D200 with an 18-200 VR at 24mm. 1/10 sec f/3.8 ISO 800. I'm usually pretty picky with the sharpness of my photo's, but this is one I wouldn't trade for 10 tack sharp pictures taken 10 seconds later. A "grab shot" indeed. I love this VR lens." Great photo! Excellent choice as a grab shot. I wonder what exposure mode the photographer used?